In 2003 most logging businesses were organized as one-person, owner-operator businesses with no employees. 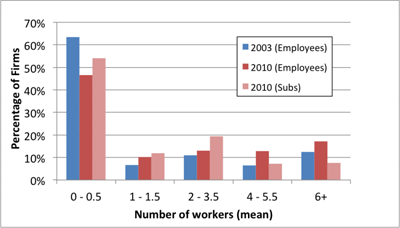 However, given the nature of the sector, we may have missed an important aspect of the labor situation in the 2003 study, the use of subcontractors. For 2010, we found that logging businesses were equally or more likely to use subcontractors than they were to have employees. It also appears that there is a slight shift toward larger businesses. The average number of full-time equivalent employees rose to 2.5 in 2010 from 1.8 in 2003. There was also an increase in portion of logging business that reported having 1 or more employees. 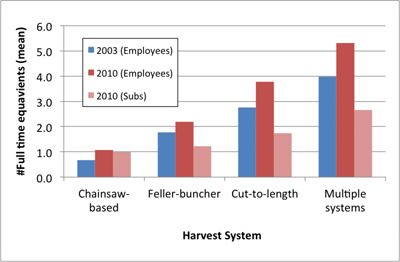 Businesses using multiple harvest systems, had the highest average (mean) number of total employees both in 2003 and 2010 (4 and 5.3, respectively), followed by those using cut-to-length system (2.8 and 3.8, respectively), feller-buncher, and chainsaw-based. The same order (i.e., multiple systems to chainsaw-based) applied to subcontractors in 2010. In 2010, logging businesses employed an average of 2 woodsworkers and 1 truck driver, followed by managers or owners (about 0.6) and office and clerical (about 0.5). All other means fell below 0.5 workers. 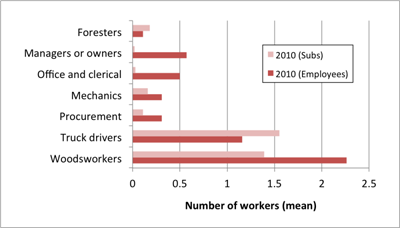 Subcontractors in 2010 were mostly employed as truck drivers (1.6), followed by woodsworkers. Firms in 2010 were more likely to have more subcontracted truck drivers than employed truck drivers. Given the demands of logging sector and anecdotes concerning labor availability, we wanted to know whether businesses were experiencing difficulty finding reliable and/or skilled workers and/or subcontractors. We also sought to learn firms were experiencing high turnover among workers. Loggers agreed that reliable workers and skilled workers were hard to find, with both scores approaching “somewhat agree” (score = 4). They were slightly more neutral regarding any difficulty in finding reliable and skilled subcontractors with both scores nearer “neither agree nor disagree” (score = 3). Worker turnover does not seem to be much of an issue for businesses, with an average score of 2.4 for the statement “worker turnover is high in my company.” Note that this statement applied to workers generally and was not specific to employees or subcontractors. 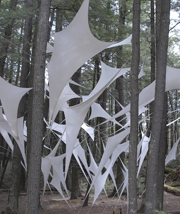 The Wisconsin Bioenergy Initiative, which is now part of the Wisconsin Energy Institute, provided initial funding for 2011 logging sector survey. Additional support was provided through the Renewable Resources Extension Act and the McIntire-Stennis Cooperative Forestry Research Program, both of the USDA National Institute of Food & Agriculture. We appreciate the assistance of Tom Steele, Grace Maples, and Sarah Traver in helping bring this project to completion.